For several decades, I've written about ghost towns, geological sites, historic places, and other stuff in Nevada and the West. During much of that time, I wrote a weekly newspaper column called The Backyard Traveler, which spotlighted those places. I also had the privilege of serving as Publisher of Nevada Magazine for 14 years. I hope you enjoy my stories. "A Short History of Reno"
My newest book, "A Short History of Reno, Second Edition" is now available! 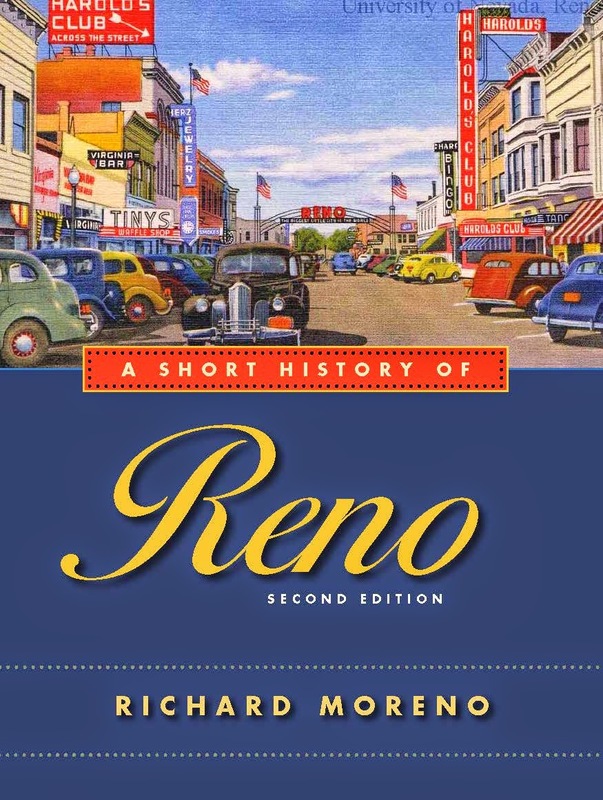 • “Reno has always been a small town where big things happen, and Richard Moreno expertly packs an incredible amount of history into a small amount of space in telling the big events that shaped the Biggest Little City in the World.” -- Guy Clifton, author of You Know You’re a Nevadan If . . .
You can reach me at: rimore77@gmail.com. Rain-pregnant gray clouds slowly circle above the solitary grave marked only by a small metal pipe cross. The sole clue to the identity of the deceased is a name and date scratched into the cross: "Mrs. Franklin 1869." As it begins to lightly rain, I stand in front of the grave and wonder for a moment about Mrs. Franklin. What did she die of? Was she traveling across Nevada when she contracted pneumonia or did it happen during childbirth? Was there a Mr. Franklin and little Franklins or was she a widow? Was her first name Naomi or Elizabeth or Anne? Why is this the only grave out here, so far from any town? I wonder: Who was Mrs. Franklin? It begins to rain. I stand for a while as the sun disappears behind the clouds and a wind not previously there begins to splash the drops all over the parched sagebrush and rabbitbrush. For a second, I wonder if I've been given a perverse sign from the heavens—may be she died of thirst. Anyone who explores the broad Nevada landscape will occasionally find a solitary grave and tombstone—sometimes the only reminders of the existence of a former mining camp, stage stop, ranch or trail. Many of these sites can be found along the pioneer trails across the state. In many of these cases, the arduous journey west proved too much for an elderly, sickly or unlucky traveler. For example, on the hillside above U.S. Highway 395, near Steamboat Springs, you can find a dark, gray granite marker carved with the image of a covered wagon. Carved words state the spot is the final resting place of Jeremiah Rogers, native of Indian, born 1830 and died 1861. Rogers apparently died while making the journey to California. Fortunately for him, 20th century descendents hunted down the site of his grave and erected the impressive marker and a small fence to protect his final resting place. Perhaps the most famous pioneer casualties along U.S. 50 are the three little LeBeau sisters, who apparently died in the 1860s while trying to cross Nevada. In this case, dysentery is said to have been the cause of death. The three sisters were buried in the sandy flats near Sand Mountain. Their graves might have disappeared by now—truly the fate of most untended solitary gravesites—except for the fact that caretakers have maintained the site, leaving flowers and erecting a small picket fence and crosses. Less lucky is Elzy H. Knott, member of a prominent pioneer Carson Valley family, whose grave is hidden in a grove of locust trees behind a bed and breakfast inn located in Genoa. In 1859, Knott, who was then 26 years old, got into a dispute with a Mormon boy over ownership of a bridle. Apparently, the argument escalated and Knott was shot to death. His father, Thomas Knott, refused to have his son buried in the Genoa Cemetery because Mormons were buried there. Instead, he laid his son on the hill behind his home and erected a fine marble headstone and wrought iron fence around the site, which can still be seen (but ask for permission from the property owners). But when it comes to lonely graves, let us not forget Mrs. Franklin. Her final resting place is located at Mount Airey (also spelled Mount Airy), once the site of an Overland Stage station and located about 17 miles west of Austin. Mount Airey was actively used by the stage from 1861 to 1868, then became a ranch before finally being abandoned in the 1890s. A small hotel was once located here, although only rock foundations—and Mrs. Franklin's grave—can be found today. The small community apparently never amounted to much and there is little reference to it over the years in any of nearby Austin's newspapers. Perhaps Mrs. Franklin once owned or worked at the hotel. Or maybe she was a ranch wife, who perished from overwork or bad water or of consumption. Rest in peace Mrs. Franklin. One of the best things about exploring in rural Nevada is finding some atmospheric, funky old-time saloon tucked away in a former mining camp or railroad town. These throw-back thirst parlors often boast elaborate wooden backbars as well as bartenders who enjoy spinning a yarn or two. Fortunately, there are still a number of these colorful old places where visitors can enjoy the ambiance and a tall, cool one, including the following. • The Manhattan Bar and Motel, Manhattan—Few places fit the description of classic water hole as does this joint, which is housed in a wooden building moved to the once-thriving mining town of Manhattan in 1927 from another mining camp, Silver Peak. Behind the bar’s false frontier storefront, which, admittedly, is in need of painting, beats the heart of this sleepy hamlet of about 120 souls. In addition to offering cold beverages, the bar doubles as the town laundromat, pool hall, RV park and a four-unit motel (it boasts the only rooms for rent in town—and even wifi). The Manhattan is famous—in Central Nevada, at least—as the home of the “Chicken Hit,” a unique game of chance. It involves placing a chicken in an eight-by-eight-foot cage, the bottom of which is painted with numbers like a giant keno board. Participants place bets on which number they believe the chicken will relieve itself. The Manhattan Bar and Motel is located at 19 Main Street in Manhattan. For more information, call 775-487-2303. A web site, www.manhattanbarandmotel.com, is under construction. The town of Manhattan is located about 45 miles north of Tonopah via State Route 376 and 377. • Santa Fe Club, Goldfield—One look at the Santa Fe and you know you’ve found the real deal. With its Western false front, wooden sidewalk, and uneven floorboards, the Santa Fe creaks with authenticity. If you want to stay overnight, the Santa Fe, with four units, offers the only rooms in Goldfield. The saloon is located at 925 N. 5th Street in Goldfield. For more information, call 775-485-3431. Goldfield is located about 25 miles south of Tonopah via U.S. 95. • The Belmont Inn, Belmont—In addition to being a surprisingly cool bed and breakfast inn that is practically in the middle of nowhere, the Belmont Inn has a very hospitable, warm bar. Called “Indian Maggie’s,” it’s housed in an 1860s stone building adjacent to the inn, meaning it’s a short walk to your room from the saloon. Inside, Indian Maggie’s has paintings of historic scenes of the Belmont area, created by a local artist, and a nice, friendly ambiance. The Belmont Inn has five guestrooms as well as a rebuilt stone miner’s cabin, located a few dozen yards behind the inn, which can also be rented. Large groups interested in “roughing it” can rent an old bunkhouse behind the main house, which has accommodations for up to ten additional guests. For information about the Belmont Inn, go to www.belmontinn.com or call 775-482-2000. Belmont is located about 40 miles northeast of Tonopah via U.S. Highway 6 and Nevada Route 376. 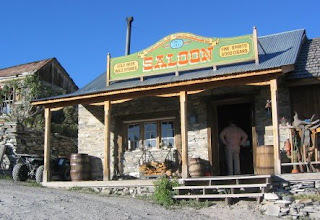 • The Pioneer Saloon, Goodsprings—Housed in a stamped metal building that was built in 1913, the Pioneer is the unofficial focus of the former mining town of Goodsprings. Inside, the Brunswick cherrywood bar and backbar have been there since the place opened but are actually older, having been built in the 1860s. An old pot-belly stove in the saloon, which is still used, is said to date to the Civil War. Additionally, atop the stove is a melted chunk of aluminum recovered from the site of a tragic airplane crash that claimed the lives of actress Carole Lombard, her mother and dozens of others in January, 1942. The crash occurred when Lombard’s plane slammed into nearby Double Deal Mountain. Lombard’s husband, actor Clark Gable, reportedly sat in the bar for days awaiting word from search crews. The Pioneer is located in Goodsprings, which is about 34 miles southwest of Las Vegas via Interstate 15 and Nevada Route 161. For information, contact the Pioneer Saloon, 702-874-9362. Sometimes you visit a place and you get the feeling that there’s more to it than what you can see. For example, some ghost towns have that almost indefinable vibe—you might only see a handful of decaying buildings but you know there’s a lot more to the place. Another place like that is Lagomarsino Canyon, a petroglyph (prehistoric Native American rock writing) site located in a remote part of Storey County. The canyon has an aura that hints of being something more than it appears to be on the surface. Of course, what's visible is pretty special: the canyon's gray rock walls are covered with perhaps the largest concentration of petroglyphs in Northern Nevada. Standing at the bottom of the canyon and looking up at the uneven rocky ridge that runs along the north side, and seeing the petroglyphs for the first time, can be one of those moments of discovery that make exploring Nevada so worthwhile. Centuries-old carvings of human stick figures, geometric shapes, animal symbols, circles, and seemingly random lines and squiggles, that even the most brilliant archaeologists have been unable to decipher, peek from the dark, rock walls and challenge all to read them. The volume of petroglyphs at Lagomarsino is impressive. By some estimates, there are thousands of carvings in the Lagomarsino site, which stretches over about a quarter of a mile. Even more amazing is that they are believed to be 2,000 to 4,000 years old. Lagomarsino Canyon isn't easy to reach, which is good because it is such a fragile place. The canyon is a designated historical archeological site so all care should be taken not to disturb anything in the area. It is against the law to damage or remove any of the petroglyphs. The dirt road leading to the canyon is rutted, rough and rocky. A high-clearance four-wheel drive vehicle is the only way to make the journey. While there are several ways to reach the canyon, one of the easiest methods is by driving to Virginia City. Continue north to the Virginia Highlands area and turn left on Cartwright Road. Drive for about three miles and turn north onto Lousetown Road. Continue on Lousetown Road for about five miles. The road winds through foothills of sagebrush, junipers and piñon pine trees. It will begin to climb before turning east and dropping into another valley. Continue east for another mile or so, heading toward visible powerlines. The road will reach an intersection with a north-south dirt road (this is Long Valley Road). Turn north and continue until you find the remains of a wrecked blue car. Continue north for a half-mile, then turn right (just before reaching a pink-colored car wreck). This road crosses a creek bed and leads into the canyon. A steel fence runs across the mouth of the canyon and a turnout adjacent to the fence offers a good place to park since the road is nearly impassable beyond that point. While the drive is a challenge (it took us a couple of tries to find the petroglyphs), it's a beautiful journey through some of Northern Nevada’s most scenic and unspoiled country. For example, if you head south of Lagomarsino Canyon on Long Valley Road you can drive through the Chalk Mountains (visibly brown and dusty), which are popular with all-terrain-vehicle riders. The road also passes scenic old homesteads including a place known as the Old Stone Corral or Cottonwood Springs, which makes for a nice shaded picnic or camping spot. Long Valley is also home of dozens of wild horses. During one visit, we counted more than 50 mustangs, including several foals, grazing in the vicinity. A good source of detailed information on Lagomarsino Canyon and Long Valley is "Mountain Biking: The Reno-Carson City Area, Guide 13," by R.W. Miskimins, which offers simple maps and directions. 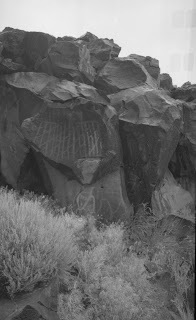 Additionally, the Nevada Rock Art Foundation has been recording all the images at various sites throughout the state including Lagomarsino Canyon. Volunteers to assist with this effort are welcome. The foundation also conducts field trips throughout the year to various rock art sites and encourages their preservation. For information about upcoming tours, contact info@nevadarockart.org. A stiff wind sweeps across a powdery, alkali lake bed and blows through the tufts of sagebrush growing around a few stone walls and foundations. They are all that remain of the mining camp of Marietta. Founded in the late 1870s, Marietta was not a typical central Nevada mining camp because its fortunes were not based on gold and silver, but on borax and salt. Originally known as Teels Marsh, the area was first developed in 1867 when salt was mined in the flat and transported by camel train to Virginia City’s booming mines (salt was used in processing ore). In 1872, Francis M. Smith, who would later become renowned as “Borax” Smith, was working the salt fields in nearby Columbus and spotted the borate potential of the marsh. He and his brother took samples from the dry lake bed, which proved to be rich in borax, and staked much of the area. Full scale borax mining begin within months of the discovery as the Smith brothers and other miners began constructing borax plants at the southeastern end of the marsh. Records indicate that wagon trains hauled the material all the way to a train station at Wadsworth, about 115 miles north. The Teels Marsh borax field was not only an important discovery for Nevada but allowed the Smiths to create the Teels Marsh Borax Company, a predecessor to the Pacific Borax Salt & Soda Co., which in the late 19th century would control the world borax market. Smith's genius was that he recognized the value of borax if marketed correctly. Prior to his efforts, borax was mined in Europe and used primarily in pharmaceuticals. Since he was sitting on huge reserves, Smith began promoting and advertising the substance as an effective abrasive cleaner. He created an immense market for his products and, in the process, became one of the early 20th century’s most successful industrialists. Smith would eventually move west to larger borax (also known as colmanite) discoveries in Death Valley and become famed for his 40-mule teams that carried the ore out of the Death Valley area. Of course, he superbly marketed his mule trains so that they and Borax became household names. The town of Marietta was established in about 1877 and soon had a post office, a newspaper, a company store owned by Borax Smith, several other businesses and more than 150 residents. A stamp mill was erected in the first year to help in the ore processing. Within a few years, the town had a row of buildings, including a dozen saloons on its main street as well as the large stamp mill and several dozen wooden and rock houses. The discovery of the richer borax deposits at Death Valley eventually signaled the end of Marietta. By the 1890s, the borax operations were abandoned and the town slid into oblivion. The drive to Marietta allows visitors to view the real Nevada outback. 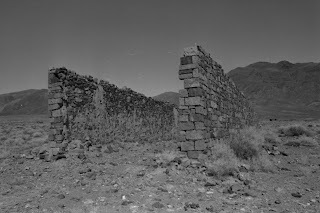 The road winds through rolling sage-covered foothills before dropping down into the flat, treeless, alkali valley that is the location of Teels Marsh and, at the southeast end of the marsh, the ruins of Marietta. The town’s signature structure is the stone wall remains of the Smith store. You can still find three of the four walls of the store standing, with a second structure, perhaps a later addition, directly east of the walls. 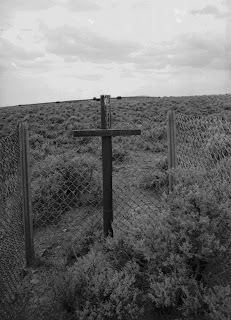 Just east of the store are the foundations and remains of the mill and, buried in the sagebrush, a handful of neglected, rude mounds can be found in the original cemetery. Additionally, near the main street there are a handful of wooden farmhouses, including one with a fairly intact stone corral and walls that appeared to have been insulated with old cardboard Crisco boxes. Another small, one-story wooden structure with a frontier storefront and a decided tilt, is still identified as the post office. A few mobile homes and ranch houses surround the ruins and indicate that Marietta still has a few residents. In the early 1990s, the area around Teels Marsh and Marietta was designated the nation’s first official wild burro range. The 68,000-acre range is home to about 85 burros that can freely roam the marsh and surrounding hills. There are designated viewing areas above the marsh. Marietta is located 56 miles southwest of Hawthorne via U.S. Highway 95, then west on State Route 360 to a marked and maintained dirt road.